This film has been touted as an awards contender for several different reasons so there was a certain expectation level attached to it as I walked into the theater. 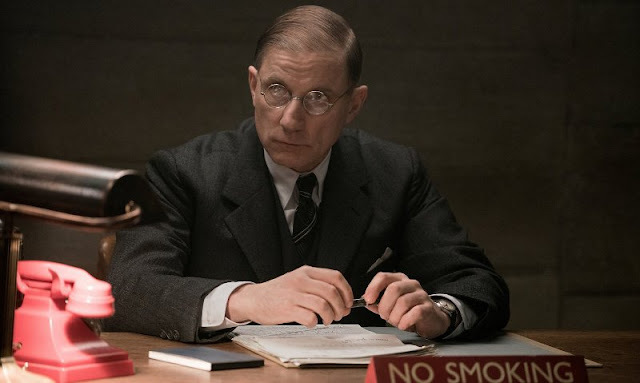 Robert Zemeckis is a great director and the two lead actors are highly respected and well liked across the board which added even more fuel to the hype machine. The movie is a beautifully filmed cinematic feature that tries to go all in as an epic, golden era Hollywood romance but falls well short of such a lofty goal. It feels and looks like something you would have seen Humphrey Bogart and Ingrid Bergman star in (the beginning of the movie is even set in Casablanca! ), and both Pitt and Cotillard are up to the task, but the story just doesn't achieve that same level of greatness. If you ever wanted to see two beautiful people in front of beautiful backdrops wearing beautiful clothes and just being beautiful while falling in love together then you will definitely enjoy this movie. Each shot is framed perfectly and the color palette is filled with muted grays and browns that allow the actors to remain front and center at all times. While Brad Pitt is the big name that everyone and their mom knows all too well, it was Marion Cotillard who really stole the show with a performance that rivals some of the best work she has done to date. The point of the story is to try and figure out if she is a spy or not and there are so many subtle hints, looks, gestures, and moments in her performance that keep you guessing in some really fun, mysterious, and emotional ways. 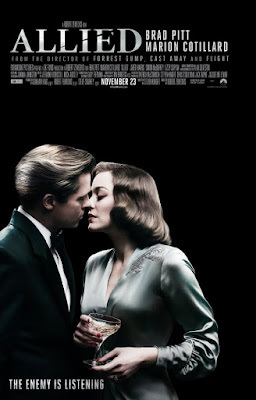 Allied is a good movie that lacks the big time, emotional punch you would expect or hope for which keeps it from being something truly special. Pitt is good and Cotillard is fantastic, but there's only so much that can be done with material that doesn't deliver on the promise of greatness. There is a lot to like about this film, but there is also a lot that will either have you scratching your head or feeling a bit underwhelmed.